Romance duo Nadeem-Shravan attempted to surmount the success of the super hit musical Saajan with Dil Tera Aashiq, directed by Saajan director Lawrence D´ Souza. The theme of romance has always been Nadeem-Shravan´s niche. Since most of Sameer´s lyrics are restricted to these romantic verses, Nadeem-Shravan have always been associated with melodious love songs, and that there are a plenty Dil Tera Aashiq. No Saajan, this is, but definitely a hit score with a lot to fall in love with. First and foremost, the songs take a procession from sweet and romantic in the title track, "Dil Tera Aashiq", sung by Kumar Sanu and Alka Yagnik. A peppy, upbeat, sweet number which was one of Sanu´s biggest hits in the nineties. Sanu and Alka have been and still are favorites of Nadeem-Shravan. We then proceed to the obligatory sad numbers, for which N-S have more than always used their jhankar, slow, beats for. Whether it be "Itna Mein Chahon" (Raaz), or "Zamane Ke Dekhe" (Sadak) and many other sad numbers, Nadeem-Shravan enhance the jhankar beats to emphasize the lyrics flowing off the singers vocales. "Hum Se Sajna Kyon Ruthe" is another really sweet sad number. Featuring as two solos by Alka Yagnik and another by Maine Pyar Kiya hit singer S.P. Balasubramanium, the song speaks about a lover´s anger at another. Both singers are excellent in these ghazal styled numbers and the song definitely hits the spot purposefully. To add some situational masti to an overall romantic soundtrack is the fun "Namaste Namaste". Alka Yagnik and Vinod Rathod, a singer who usually sings in these peppy tracks, add life to this fun track which is more of an in film entertainer, unless you´re looking for some laughs. "Kam Se Kam Itna" competes with the title track for the most entertaining song on the soundtrack. The musical base is pretty different than what N-S usually dish out and the renditions of "beqarar hai" is infectious. Rare singer Mukul Agarwal sings with Alka Yagnik very well. "Pyar Se Badle, Pyar Milega" is another excellent romance song. There is an excellent cosensus between Alka and Kumar and Sameer´s lyrics are very appealing. Less entertaining "Muhje Kuch Kahna" probably becomes less appealing because of the odd singing duo of Sudesh Bhosle and Sadhna Sargam. Sadhna Sargam constantly re-appears in soundtracks after dissappearing giving her voice a refreshing approach all the time. Still very sweet, but on the whole quite regular. Of course for a Salman Khan film, Salman must have a solo, and that is provided here with "Pyaasa Huen Ka Paasa". Udit Narayan makes his sole contribution to the soundtrack. The song amounts to just another regular hero solo and eludes of regular instrumentation. Dil Tera Aashiq has always been popular for "Kam Se Kam" and the title track and when you listen to the melodious tunes you can see why. 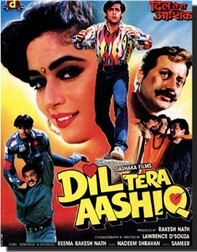 Nadeem-Shravan have always had the touch for making these romantic soundtracks work, Dil Tera Aashiq is another contribution to the shine on the crown of melody kings.